Pittsburgh, PA (October 9, 2012) — The St. Lucie County Clerk of the Circuit Court is now live with Grant Street Group’s ClerkAuction® platform at www.stlucie.clerkauction.com. With ClerkAuction, the St. Lucie Clerk’s Office will now conduct tax deed sales online. 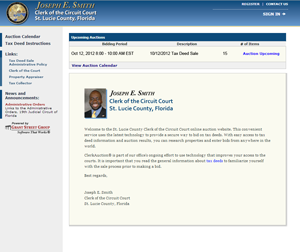 The first online sale is scheduled for Friday, October 12th, with bidding beginning at 8:00 a.m.
“The Clerk’s Office is committed to utilizing new technology to improve efficiency, customer service, and provide greater access to the services we offer,” said Joseph E. Smith, St. Lucie County Clerk of the Circuit Court. “Conducting online tax deed sales allows us to reach a wider pool of bidders, automate many of the tasks associated with the sale, and make the sale process more transparent to the public at large,” continued Clerk Smith. Grant Street Group designed ClerkAuction as a flexible and powerful application that not only auctions tax deeds and foreclosures online, it also provides the necessary tools to facilitate the Clerk’s workflow process including reconciliation of deposits and payments, and automated bulk printing of the post-sale documents, such as deeds and certificates of title. “The St. Lucie Clerk is a significant addition to Grant Street Group’s Florida client base, which includes the Palm Beach County Clerk and Comptroller” said Ian Yorty, Director of Florida Business Development for Grant Street. “Because the St. Lucie County Tax Collector uses Grant Street Group’s tax collection and billing system software, TaxSys®, the Clerk’s Office can manage certain pre-tax deed sale functions in the tax collection system. The ClerkAuction system will also be able to communicate with the tax system to ensure there are no last minute redemptions of delinquent taxes prior to a deed sale. The ability to sync the two systems creates an important internal control,” continued Mr. Yorty. For more information about ClerkAuction services, please contact Ian Yorty, Director of Florida Business Development, at (305) 710-8926, or Ian.Yorty@GrantStreet.com.